This is the second of three Chrestomanci review posts! Volume 1 (Charmed Life and The Lives of Christopher Chant) is here. In this multiple parallel universes of the Twelve Related Worlds, only an enchanter with nine lives is powerful enough to control the rampant misuse of magic — and to hold the title Chrestomanci… There is a world in which the peaceful city-state of Caprona is threatened by the malevolent machinations of a mysterious enchanter…and another in which magic is outlawed and witches are still burned at the stake. In two worlds the practice of magic has gone dangerously awry, there is only one solution — call upon the Chrestomanci. 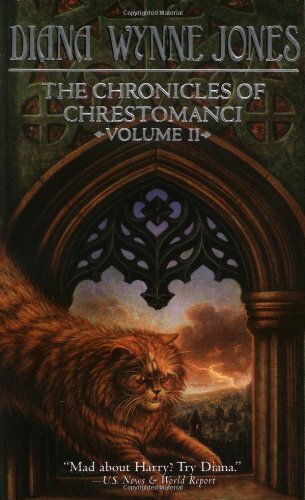 Before Conrad’s Fate turned up, this was my least favorite Chrestomanci book, and that was mostly because I keep miseremembering it as being bad. However, it’s NOT bad. Maybe it’s a little annoying, because I’m the sort of person who is annoyed by generations of families fighting for no reason and never thinking that maybe, y’know, 200 years is too long to hold a grudge for a reason that you can’t even remember properly, and maybe they should just stop now before it gets REALLY embarrassing, but it’s NOT a bad book. I had a good time reading it, this time around! Usually I just skip it and move on to Witch Week. Witch Week is another DWJ book which I think is PERFECT. It shows how well DWJ understood kids, even if they’re magical kids who can fly on broomsticks and what have you. Every kid in here is believable in a way that makes you want to kick them, and I think that’s a mighty fine accomplishment. Plus it’s a good story, of course! I know a lot of people don’t like Witch Week, but I can’t remember why. Even if the school is terrible, and even if most of the kids are pests, it’s still an enjoyable story, don’t you think? It’s kind of edgy, actually, what with the government outlawing witchcraft and burning witches at the stake still. Usually DWJ sticks with abusive parents and/or vaguely dangerous monsters when she wanted a bit of horror in her stories, so having murders/executions/etc. is quite heavy for her. Get your own copy @ Amazon or BookDepository.com and support Birdbrain(ed) Book Blog through the power of affiliate earnings! Or find a copy in your local library and support people other than me! I have no idea why anyone would dislike Witch Week. I always just assume they haven’t come to love it yet. I didn’t love it the second I read it, but came to love it on a reread (as always with DWJ!). I think the way she portrays the burning — when Charles talks about how surprised the burned witch looked — is really chilling in its everyday-ness. Hearts. Yes! That was really surprising, because I don’t think DWJ has a whole lot of deaths in her books, does she? So even when random background characters die, it’s shocking. And that they’re BURNED to DEATH…!